Explore the Arctic Circle with Paul Theroux! Take a steam train through the Arctic Circle with travel writer Paul Theroux from June 13-26, 2009. The Trans-Siberian Railways and Exeter International have partnered up to offer this incredible journey, which is sure to be memorable, especially since you’ll be traveling by train. The trip begins with a city tour of Moscow on June 13, and once on the train you’ll visit such places as Pavlovsk, St. Petersburg, Pskov, Novgorod, Petrozavodsk, Kola Peninsula, Murmansk, Nikel, Archangel, Vologda, and Uglich before returning to Moscow at the end of the tour. 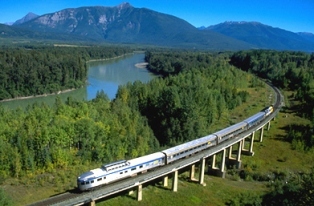 You’ll spend two nights in Moscow at the Marriott Aurora, and 11 nights aboard the Trans-Siberian Express. The trip has limited space and prices start at $12,795 per person, based on double occupancy. For more information on The Arctic Circle by Steam Train Journey with Paul Theroux click here. Get in shape while seeing the world solo!